Yes, on successful completion of the course, you will receive Accredited Certification, which is held on a national register. As a care worker driver, what are my responsibilities..? A care worker driver of a care home or healthcare minibus is personally responsible for its roadworthiness. If any defects are found by the police or the DVSA it is the driver who will be prosecuted. The driver is also responsible for any road traffic offences committed. No, If your care home is registered as a charity or a “not for profit organisation”, then you will be eligible to operate under a Section 19 Permit (formerly known as a small bus permit). However if you are registered as a commercial care home then you will require an operator’s licence, as anyone operating passenger carrying vehicles in return for any kind of reward are legally required to operate under O licence regulations, because of the interpretation of the “hire or reward” phrase, which will exist in the majority, if not all, of commercial care homes. “Hire or reward” means any payment made for, or on behalf of a passenger, to give them the right to be carried on a vehicle. In law this is interpreted very widely, like residential care fees, for example. Private, commercially run care homes will need to apply for a PSV operator’s licence, however a restricted operator’s licence may be sufficient if there are only one or two vehicles being run within the organisation. Do our drivers need a special license..? If you do not run an Operator’s license, then No. However, if you do run an operator’s license, then your drivers will require the full D1 (PCV) entitlement (with no licence restrictions) on their driving licence. Will our drivers need additional training..? If you do not run an operator’s license then no. However, if you do run an operators license then Yes, your drivers will also be required to undertake the Drivers’ CPC. 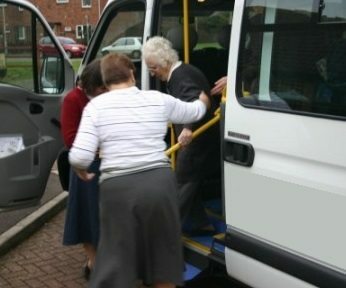 This is obtained as part of their initial PCV training but also requires that they undergo a programme of ongoing training by approved providers, of which Accessible Ltd are a registered Jaupt approved training company, which again is able to deliver the required total of 35 hours training across the UK. This additional Driver CPC training must be completed every 5 years, in order to comply with legislation. Check out our Driver CPC page for more information. Why should we use Accessible Ltd..? Many years of experience allow us to provide accredited training for minibus drivers, including essential refresher training. TBC – Call 01282504455 for latest course dates. Is your care home & healthcare transport safe and legal? See FAQ on the left of this page for further details, you will require an operator’s licence and your minibus drivers will also need additional training, see our Driver CPC Training courses. Do You Carry Wheelchair Users? Are your Drivers / Carers trained & certified competent to load and secure the wheelchair User Correctly? The Old Bailey heard that employees had not secured the lady in her wheelchair, and workers had not been given adequate training by the charity to ensure wheelchair users were safe while travelling. Don’t leave yourself open to corporate manslaughter! Have your staff trained and certified to use all the different types of wheelchair tiedown equipment currently available, to ensure they correctly secure the wheelchair, and to correctly fit and secure the wheelchair occupant restraint system. Have them trained and certified to load and unload passengers correctly, operate the passenger lift correctly and to deal with emergency situations correctly. Accessible Ltd are the market leaders, on delivery of specialising training in “The safe transportation of wheelchair users”, with all the equipment Manufacturers approvals, to deliver certified training on their products, on your site, anywhere within the uk. Call now to book or use the online booking form. MiDAS 4 Care Homes & Healthcare – Standard Training. course is presented in a practical, friendly manner with the Driving Assessor / Trainers able to respond to the specific needs of each person on the course. The theory sessions are complimented by watching relevant videos. The course also includes the practical emergency procedures, as well as practical examples of how to check a minibus for road worthiness and a practical driving assessment. MiDAS 4 Care Home & healthcare – Accessible Training. As above but with theory and hands on practical training, in the use of accessible equipment, in order to safely load and transport wheelchair users and the disabled. This incorporates equipment from all Major manufacturers, including Koller, Unwin, Nmi, Qstraint, and AMF Bruns.